Educational qualification & Pay Grade etc. Principal (Pay Scale: 37400 – 67000 AGP 10000) Possess a Bachelor’s and Master’s degree of appropriate branch in Engineering or Technology with first class or equivalent either at Bachelor’s or Master’s level and Ph. D or equivalent, in appropriate discipline in Engineering or Technology obtained from any of the Universities established or incorporated by or under the Central or State Act in India; or any other educational institutions recognized as such or declared to be deemed as university under section 3 of the U. G. C. Act, 1956. Head of Department: (Pay Scale: 37400 – 67000 AGP 9000): . Bachelor’s and Master’s degree of appropriate branch in Engineering / Technology with First Class or equivalent either at Bachelor’s or Master’s Level Minimum 10 years of relevant experience in teaching / Research / Industry. Lecturer: (Pay Scale: 15600-39100 AGP 5400/6000) : Bachelor’s degree in Engineering / Technology in the relevant branch with First Class or equivalent. If the candidate has a Master’s degree in Engineering / Technology, first class or equivalent is required at Bachelor’s or Master’s or equivalent, in appropriate discipline in Engineering or Technology obtained from any of the Universities established or incorporated by or under the Central or State Act in India; or any other educational institutions recognized as such or declared to be deemed as university under section 3 of the U. G. C. Act, 1956. Norms for Faculty in Computer/IT Branch: (Diploma Engg.) Candidate who has done MCA/M. (Mathematics)/M. Sc. (Physics)/ M. Sc. (Electronics)/M. Sc. (IT)/M. Sc. (Electronics Science)/ /M. Sc. (Computer Science) is eligible if following conditions: First class must be at UG & PG level. Lab assistant: (Pay Scale: 5200-20200 AGP 2400) Possess a diploma in relevant branch of engineering or technology obtained from a technical examination Board or any of the Universities established or incorporated by or under the Central or State Act in India; or any other educational institutions recognized as such or declared to be deemed as university under section 3 of the U. G. C. Act, or possess an equivalent qualification recognised by The Government. Librarian: (Pay Scale: 5200-20200 AGP 2400); Possess a post graduate in library and information science obtained from or any of the Universities established or incorporated by or under the Central or State Act in India; or any other educational institutions recognized as such or declared to be deemed as university under section 3 of the G. C. Act, or possess an equivalent qualification recognised by The Government. Administrative Officer: (Pay Scale: 9300-34800 AGP 4200) : Possess a Master of Business Administration or equivalent obtained from or any of the Universities established or or incorporated by or under the Central or State Act in India; or any other educational institutions recognized as such or declared to be deemed as university under section 3 of the G. C. Act, or possess an equivalent qualification recognised by The Government. Clerk: (Pay Scale: 5200-20200 AGP 2400) Possess a graduate or post graduate of Any Stream or obtained from or any of the Universities established or incorporated by or under the Central or State Act in India; or any other educational institutions recognized as such or declared to be deemed as university under section 3 of the U. G. C. Act, or possess an equivalent qualification recognised by The Government. Interested and eligible candidates can send their Prescribed Application format along with all necessary documents, Certificates at mention below address. The last date of application is 30/09/2017 through online mode only. There is no Application Fees. You need not to deposit any Fees for application. Eligible candidates will be contacted through their e-mail id only. Any type of canvassing by any candidate (directly or indirectly) will lead to disqualification of the Candidate. Further process of recruitment will be conveyed to the selected eligible candidates only through their e-mail id only. For the rest, notices will be issued on the official website of the college. 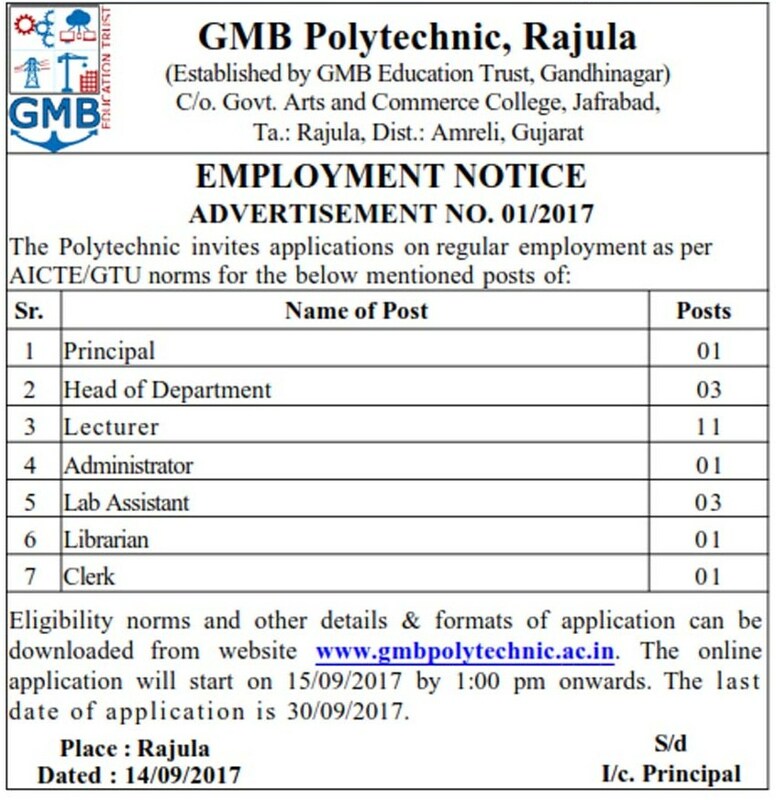 Apply online GMB Recruitment 2017 | Apply Now.